ER Beta antibody LS-C15081 is an unconjugated rabbit polyclonal antibody to ER Beta (ESR2) from human, mouse, rat and other species. Validated for GS, IHC and WB. ESR2 / ER Beta antibody was raised against synthetic peptide corresponding to aa 100-115 (A100EPQKSPWCEARSLEH115) of human, mouse and rat ER (estrogen receptor ). Percent identity by BLAST analysis: Human, Gorilla, Gibbon, Monkey, Marmoset, Mouse, Rat, Elephant, Bat (100%); Sheep, Dog (94%); Panda, Bovine, Horse, Pig, Opossum (88%). Recognizes human, mouse, rat and non-human primate ER. Detects a band of ~55kD by Western blot. Does not cross-react with ER. 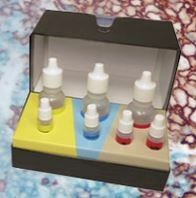 Gel Shift Assay (1-5 ug/ml). Immunohistochemistry ( (frozen sections, paraffin sections (1-2 ug/ml)). Western Blot (1-2 ug/ml).